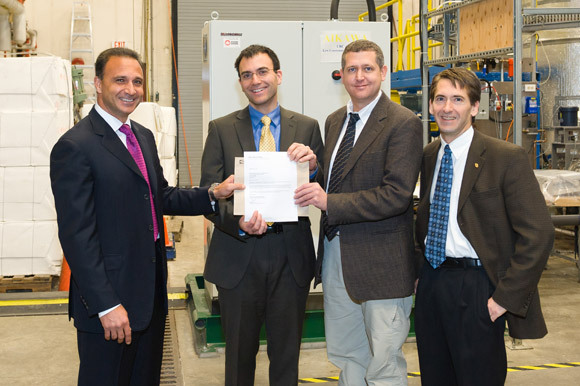 Joe Nemeth, president and CEO of Canfor Pulp Products Inc., presents a $75,000 grant award to André Phillion, Mark Martinez, and James Olson, director of the Pulp and Paper Centre at UBC. An industry giant in pulp and paper products has awarded two UBC engineering professors for research knowledge leveraged across both campuses. Canfor Pulp Limited Partnership (CPLP) presented the award -- the first instalment of a $75,000 grant over three years -- to professors André Phillion and Mark Martinez. Phillion, an assistant professor in the School of Engineering at UBC’s Okanagan campus, explores the field of materials science through modelling, microscopy and 3-D imaging using X-ray technologies. Martinez, a chemical engineering professor, conducts research in the Advanced Fibre Processing Laboratory at UBC’s Pulp and Paper Centre in Vancouver. The combined work by Phillion and Martinez provides new insight into strengthening mechanisms in NBSK pulp. “First, the research will focus on characterizing paper architecture using 3-D X-ray tomographic microscopy, a technique similar to CT imaging but on a much smaller scale,” says Phillion. “Second, models will be developed to predict the strength of paper produced under different refining conditions based on the 3-D structure of the pulp fibres. CPLP’s CEO Joe Nemeth says the UBC project has multiple benefits. “This project will help us better understand our fibre, and it complements a project on pulp refining we are now supporting in the UBC Pulp and Paper Centre,” he says. Nemeth also praised CPLP’s new affiliation with the School of Engineering at UBC’s Okanagan campus, and the collaboration between the two campuses. The research award is the first in a grants program announced by Canfor in June 2011 to foster collaborative research in the pulp and paper industry. CPLP is the largest producer of market kraft pulp in BC, and the third largest in the world. CPLP employs 1,200 people in BC and annually produces pulp and paper products worth $1 billion.